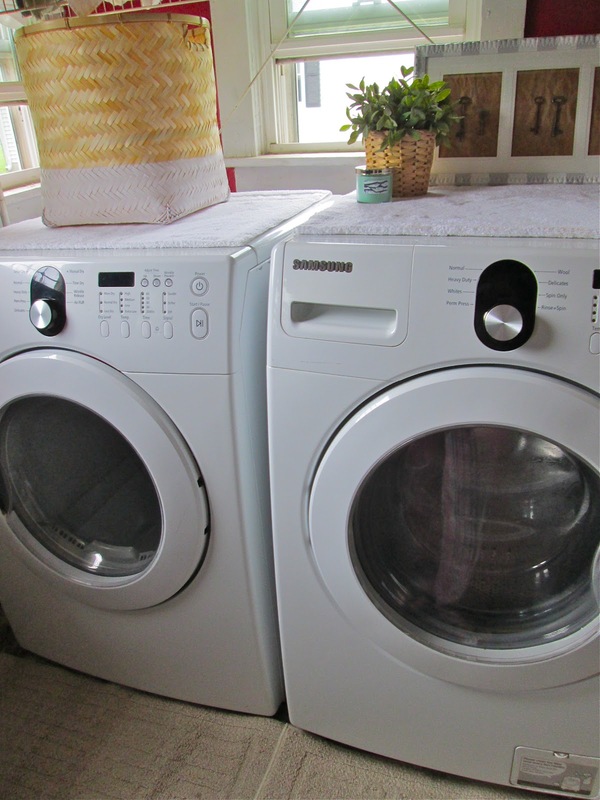 Considering I stayed home all weekend and did four loads of laundry, I've kind of been thinking a lot about the laundry room the past few days. Our laundry room is on our "back porch" - a small, fully enclosed room on the back of the house, which isn't heated or air conditioned, and is not in the best shape either. It has a concrete floor and is painted red, which is not really my style at all. If I could, I would paint it a light blue or green, or even a sunny light yellow. But we're not really doing anything with paint in there until after we can fully remodel. I try not to go back there often (unless of course, I have to do laundry, or take our dog Saleen outside). I haven't posted any photos of our laundry room yet, so I thought I would share a few on the blog today. Our washer and dryer are both Samsung. 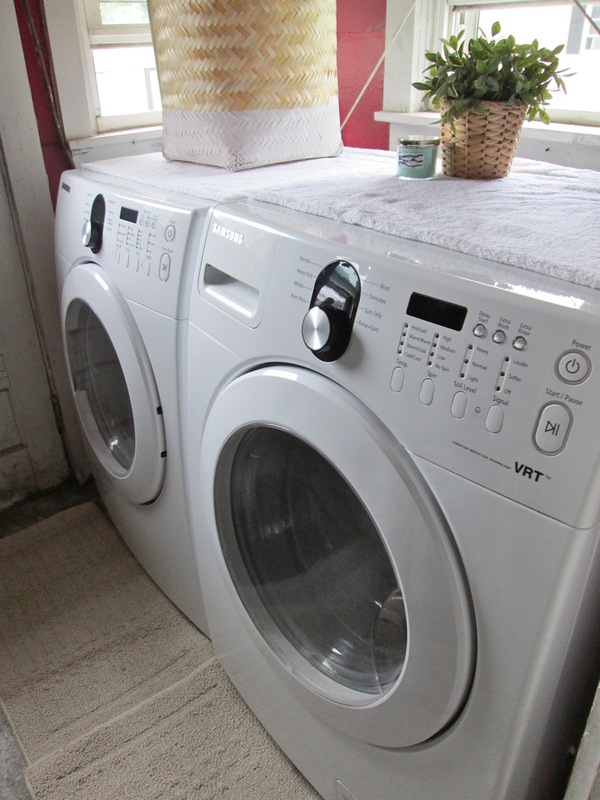 We actually bought them as a set on Craigslist when I moved in, in 2010 - they were only a year old, still had warranty information from Lowe's, and had only been used a few times. They were pretty much as good as new, and we got them as a set for $900, which was an awesome deal, since brand new they would have been probably twice as much. The girl we bought them from actually turned out to be the cousin of a friend of ours. She was originally asking $1000, but I asked if she would take $900, and she said yes, so they were ours! 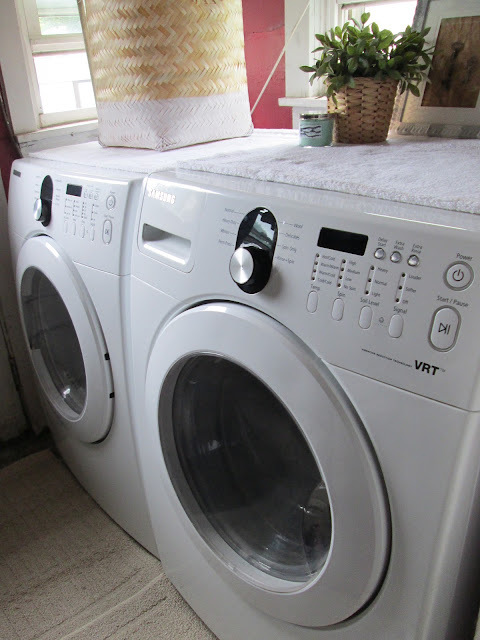 We've had them for about 2 1/2 years now, and they have worked perfectly! They were one of our first big purchases for the house. You can see that I added the basket I got for $10 at Marshall's a couple of weeks ago. It was just sitting in my office, so I thought - that should definitely be in the laundry room. It will certainly come in handy in there. The potted plant is a fake one from IKEA. I love the texture of the pot. 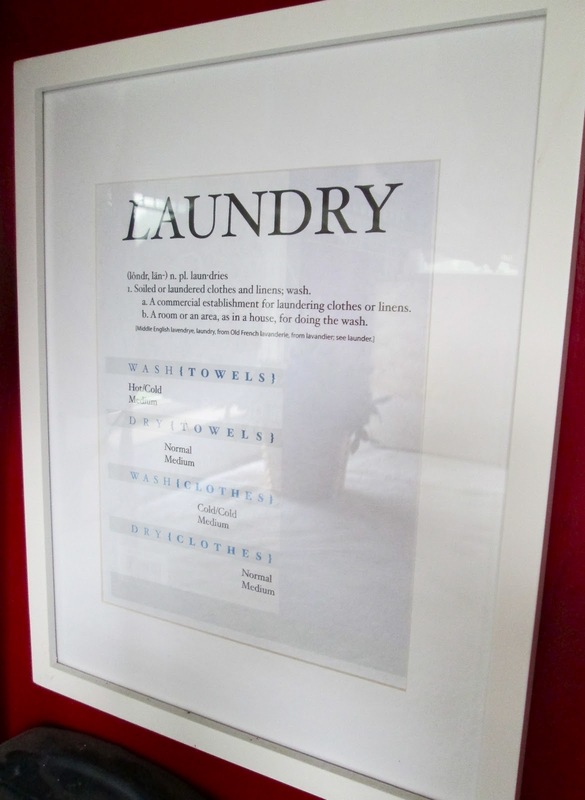 I made this sign for the laundry room not too long after I moved in - it helps me remember which settings to choose for towels/bedding and then for clothes. :) I seriously still look at it every time I do the laundry. Haha. The other day I had the idea to add my DIY skeleton key art to this room, since I still hadn't found a place for it yet. I like it in here for now, since it adds a little more personal touch to the room. One thing I do like about this room is how sunny and bright it is - There is a screen door, along with three windows in this tiny little space. I can't wait to redo this room and put in some cute little floral curtains, or bamboo blinds (they will probably always be open though!) 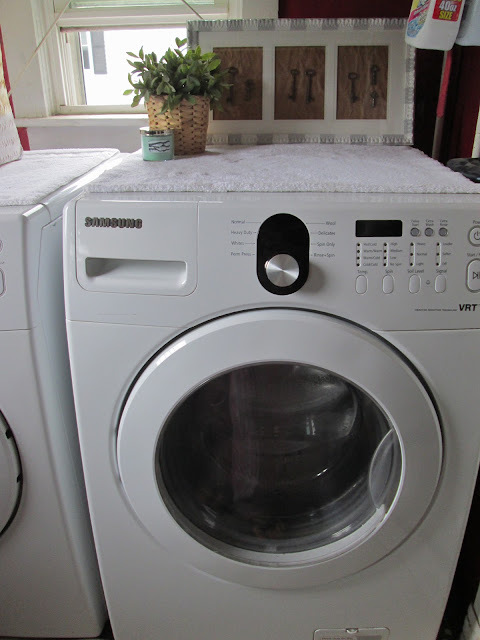 I would also love to put a wooden top over the washer and dryer (like John and Sherry at Young House Love did in their first house), so it's all one big surface.